Just like in the previous two weekends we drove a bit to get more familiar with Bangkok and it's surroundings. We went North and past the old Don Mueang international airport. We did not had any plans and unfortunately we did not bring any camera with us. Soon after the airport we saw Ayutthaya on a sign. Around 10 years ago we also visited Ayutthaya because it's a well known tourist destination for tourists from Bangkok. Located less than 90 kilometers from Bangkok it's one hour by car. 10 years ago we did it by train, if you have time I would recommend it because it's just a nice relaxed way to travel to this ancient city. The news about the floods in Thailand is bad. At least 25 people have been killed and as many as 1.2 million people have been affected by the floods. I woke up early this morning to catch the plane to Chang Mai. After more than 10 years back in this city at 09.30 and I don't remember or recognize much. At that time Christina and I visited Chang Mai together with our Belgian friend Renaud. We took the night train from Bangkok and the plane back. During daytime we did elephant riding and rafting, at night time we went to bars and the night market. But still I expected to remember something. For example the old city walls or the canals in the city center. The thing I remember are the nice green hills surrounding Chang Mai. A nice and warm Sunday. We drove with our car to explore the main roads and highways better. Just to get an idea how to get somewhere fast, and we also discovered another highway exit close to our house. We are back from our weekend in Pattaya. The resort was very nice, we actually met the founder of Cabbages & Condoms. The children could gather eggs from the chicken. Funny, they play Mozart for the chickens all day long. We saw all kinds of tropical plants, bunnies were hopping around and our shower was something between out and indoor showering. When I took I shower a squirrel showed up, can you imagine. 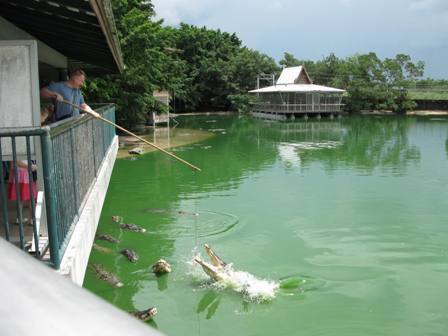 Anyhow, today we left and before we went back to Bangkok we visited a Crocodile farm. And what do you do on a farm like this, you feed the Crocodiles. See that nice Crocodile snapping at the piece of chicken I am trying to feed him.